Is it game on for Zynga now it's got the Xbox factor? 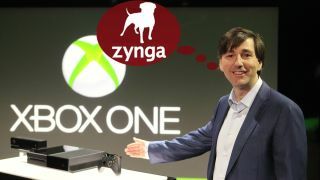 In the same week that the Xbox 360 was revealed to be the most popular console of its generation in the UK, the brand has lost its mentor, Don Mattrick, to social gaming giant Zynga. Given that Mattrick was instrumental in the success of the Xbox 360 and paved the way for innovations such as Kinect, this is a better deal for Zynga than Microsoft. Mattrick leaving Microsoft certainly doesn't feel like a push, even if it looks like one. Even with Mattrick's complete failure to paint the right picture when it came to the Xbox One's always-on, DRM policies, this isn't the same as Scott Forstall's ousting from Apple – he is not being usurped so much-needed changes can be made. You only have to look at the figures to see this. During his seven-year tenure, Xbox Live members rose from 6 million to 48 million - a phenomenal amount. Even though the Xbox One's announcement was fumbled, pre-orders are looking strong. This is not a man who was ousted, but someone looking for a new challenge. And challenges don't get bigger than turning around Zynga's flagging fortunes. Microsoft head Steve Ballmer in his email outlining Mattrick's transition said it best when he thanked Don "for setting [Microsoft] on a path to completely redefine the entertainment industry". Note that Ballmer said "entertainment" and not gaming. There is a real fear at the moment among both Sony and Microsoft that gaming just isn't enough to entice people to the next generation of consoles – these devices have to become the centre of your living room's home entertainment needs to stay relevant. Interestingly, Mattrick signing on as CEO of Zynga means that relevance will still be the biggest challenge facing him. A damning Reddit post last month highlighted the problems Zynga is up against at the moment. In June Zynga laid off 18 per cent of its staff, some 520 employees. One of these took to Reddit to blow the whistle on the current goings-on at Zynga, highlighting a gaming culture of copying and a company burning through money while failing to adjust to a changing gaming market where social gaming has lost much of its lustre. Zynga needs to prove its relevance and Mattrick is well placed to achieve this. With a background at EA – and having to deal with the Xbox One fallout – he is no stranger to heading up companies that are successful but constantly at the centre of bad press. Given that, for many, Zynga puts the bile into mobile gaming he will need to rely on what he has learned from his past endeavours to get the company back on track. Microsoft has lost a key cog in its future gaming machine and Mattrick's leaving marks something of an end of an era to current console gaming. The Xbox One and the PS4 have a battle on their hands to keep the millions of gamers who currently use their devices within their ecosystem. Mattrick will now be at pastures new, tending to his virtual farm, hoping to prove to the world that there is still life in social gaming. Draw (something) from that what you will. Microsoft's Xbox One faces challenges galore - is it destined to suffer thanks to its DRM switcharoo?